I’m glad you think so. Thanks very much for your comment. Wow, very nicely done, makes for a gripping surreal piece! Hi Ron, thank you! I wasn’t sure how people might respond to this. Gripping is good. Yes, Karen, it makes you stop and look carefully, which is what art is supposed to do. It does evoke sadness and mortality, but that is what art can do also. I’m appreciative of your comment, Judy, thank you. Hi CJ, thank you. I’m glad you think so. making the image not too heavy. I like it. That’s good to hear, Yoshizen. Thanks very much! Beautiful work, Karen. Great to see this seagull brought back to life. Thanks, Simon, that’s a nice comment. Oops, I just commented as the digital lightroom. As I said with my other hat on, I think this is a really remarkable photograph Karen. It won’t let me go.. I love that it won’t let you go. I think that a common reaction, especially among us non-photographers, is to shy away when we see a dead animal. But you stopped to observe it, saw it moving with the water, captured it and made something beautiful of it. That is fantastic! Yes, sometimes I photograph the strangest things but it seems okay somehow, part of the process of photographing almost daily. I like the photograph’s composition . . . but I can’t help being reminded of Monty Python’s Dead Parrot skit . . . that is an ex-gull. I had to re-watch that the Dead Parrot skit just for fun. It was already on my mind because I had a meeting just before lunch, and we were talking about hardening an aluminum frame, and the guy made the comment that too much current would burn it. I asked what burn meant in that context . . . he said it meant it would be no more, gone, would cease to be. I asked him if he was quoting the dead parrot sketch, and he did not know what that was. I looked at your photo shortly after that, and you made the comment the waves were moving it as if still alive . . . ergo . . . dead parrot skit. And yes, I had to rewatch it as well. Touchy composition, wonderfully made. In camera or later on Pc? I never used the multiple shooting option, but I doubt it’s easy to cope with lights on site. This is put together with Photoshop, although I do make in-camera double exposures quite often. They are challenging to make. Thanks very much for your comment! Thank you, Marina. I’m happy you think so! Great composition Karen – and better still that the gull looked so relaxed almost like it was lying back with his its legs crossed just basking in the fresh air 🙂 welcoming your gaze. Thanks Veronica, yes, somehow it looked so peaceful. It stuck me as being strangely beautiful. Such nice words, thank you Elena! This is ridiculously beautiful. And it really almost looks like a drawing or a painting. Sarah, thanks for the great comment, coming from someone who makes such incredible art, I’m touched. Karen – this is simply stunning. And, as always, your words add so much to the image. Thank you, Melinda, much appreciated! Yes, I guess so! Thanks for your comment. Your camera gives new breath to unfinished stories. Striking composition, unique subject matter. Great. I love your comment Alessandro, thank you! Stunning. The light on the gull is beautiful, also the idea and composition. Very strong picture. Could be a Sally Mann! That’s a very nice compliment, thanks so much, Gilles. Delicately handled, mysterious and beautiful. I found dead geese and ducks frozen in a field this winter – something about flightless birds with wings still open that haunts. 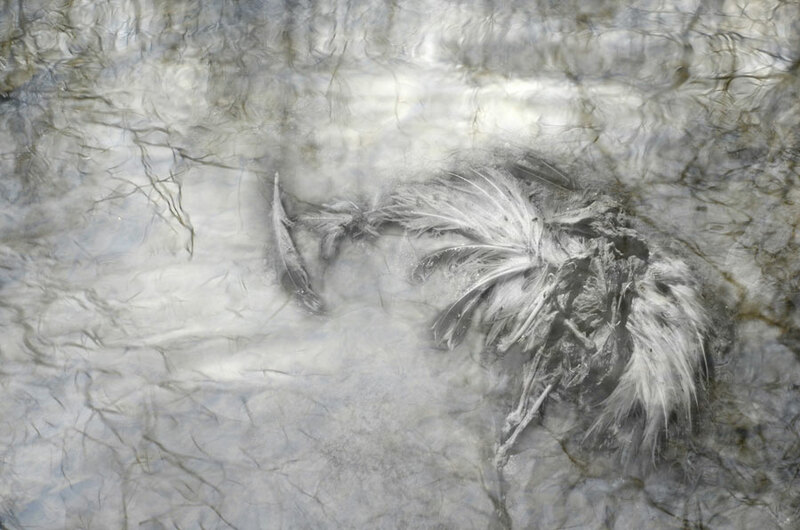 This has the look of marble, too, or an archeological specimen. Did you photograph the flightless birds? I find them sort of hauntingly beautiful, too. Thanks very much. Love the complexity and details, and composition. Very good, karen. Bente, thank you. Much appreciated. I’m happy you think so, Helen. A delicate and powerful image at the same time. Very moving. Gorgeous composition Karen. I come across ex-birds quite often here (though in an urban context, and I find them quite beautiful. Usually it’s wings that are left, often fully extended … a different sort of flight. This image also call to mind Chris Jordan’s heartbreaking images from Midway Island. Are you familiar with his work? Hi Sydney, thank you. I have seen Chris Jordan’s birds before – it’s just a heartbreaking situation. Very well done and thought out Karen. It is very powerful. When are you going to be featuring your work in a gallery? An amazing juxtaposition of firebird and water! La vie nous tendre les bras , quand l’Oeil perçoit l’Union . I have been visiting your blog for a while now, and I am always awed, surprised, touched… The picture of the bird is poignant, poetic, thought-provoking. Hi Dominique, thank you for your comment. It’s very nice to get such thoughtful feedback. You have made such a beautiful image of something that in the first place sounds all but beautiful. I love the texture and tonality of the pictures. The composite image feel feels so organic and alive. Great work! Hi Otto, I very much appreciate your feedback. Thanks so much, I’m glad you like it! Oh! This is my favourite of your recent collages – something very definite about it – real flesh and bone inside some kind of dreamlike fantasy form..
Real flesh and bone for sure – I’m glad you like it, Cath. Such a painfully powerful..beautifully evocative image. Nice work! Feels prehistoric and personal at the same time. How profound and beautiful. Hi Steven, thank you. Prehistoric, I hadn’t considered that but I like that connection. This is quite an arresting image. I had to look at it up close and for a long time. I may have more to say at some point! Is it a one off or part of a series, do you think? Hi Emily, looking at something close for a long time – who could ask for more. That’s great response, thank you. This seems to be evolving onto a series, it started with a fish! Gosh, is it just me who is detecting a maned head with eyes, nose and an almost toothless mouth? It’s only now, on my third visit, that I noticed it, but this phenomenon might be the reason why I was so fascinated on first sight. . I hadn’t spotted that but I think I know what you mean. Fascinating work!! Very inspirational. I think I see another ‘visage’ as does Sean J. . Is signature of your successful abstraction.I’m glad WP oriented me to your site!